International Journal of Research in Health Sciences,2014,2,3,783-786. 1-Assistant Professor, Department of Microbiology, Sree Narayana Institute of Medical Sciences, Chalakka, Ernakulam, Kerala, INDIA. 2-Professor, Department of Microbiology, Govt. Medical College, Thrissur, Kerala, INDIA. 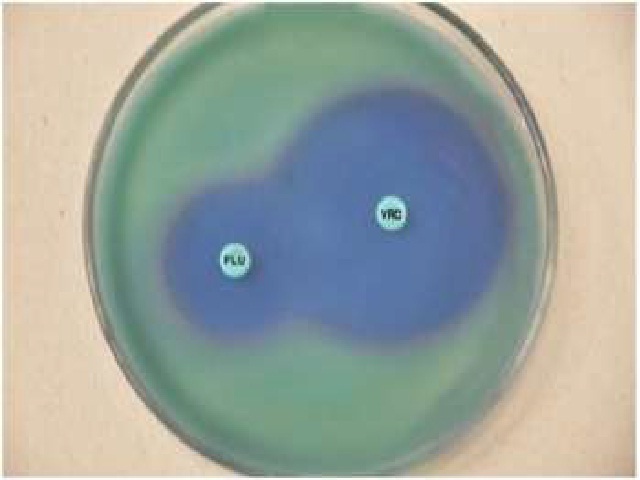 The in vitro susceptibilities of fluconazole and voriconazole against a total of 95 Candida isolates during the one year study period August 2010 – July 2011 in a tertiary care centre , South India was determined by the agar disc diffusion test using the Clinical and Laboratory Standards Institute (CLSI) M44-A2 guidelines. Out of 95 total isolates, we got 43 Candida tropicalis, 31 Candida albicans and 21 Candida parapsilosis. 3.2 % of total isolates were fluconazole resistant but all were sensitive to voriconazole. None of them show Susceptible- dose- dependence (S-DD). 100% of C.albicans were sensitive to both fluconazole and voriconazole. 2.3% of C.tropicalis isolates and 9.5% of C.parapsilosis were resistant to fluconazole. The study demonstrated a better in vitro activity of voriconazole, against the fluconazole resistant strains of Candida. But as the fluconazole resistance is rare and the species which are intrinsically resistant to fluconazole like C.krusei and C.glabrata were not prevalent , flucoconazole can still be used as the drug of choice for empirical therapy of uncomplicated candidiasis. Voriconazole can be reserved for salvage treatment of refractory candidiasis caused by resistant strains.